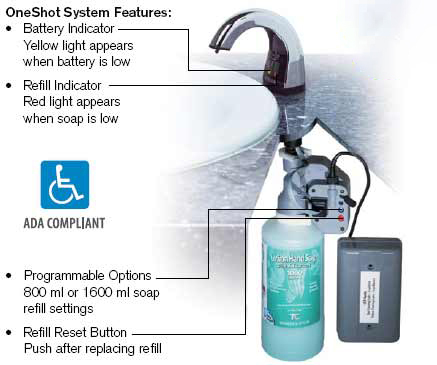 Sets the standard for reliability in counter-mounted dispensing systems utilizing patented Smart Sensor™ technology to detect hands and automatically deliver the perfect amount of soap – every time! Washroom visitors will appreciate the ultimate touch-free hand washing experience of our luxurious soaps and reliable, hygienic dispensing. Premium soap formulas that produce thick, rich lather delivered touch-free for a luxurious hand washing experience. OneShot offers a wide choice of formulations, hypoallergenic, for sensitive skin, and antimicrobial soaps. All soaps contain special skin conditioning ingredients to soothe the skin. Automatic, touch-free delivery eliminates cross contamination to help reduce the spread of germs and encourage hand washing. Disposable refills with TC’s Hygienic Seal™ keeps soap fresh and clean providing a more sanitary system. A recent study revealed that 25% of reservoir or bulk soap systems were contaminated with potentially harmful bacteria(1). OneShot Pure & Natural soap is Green Seal Certified. Controlled dispensing reduces soap consumption so there are fewer chemicals in the waste stream and water usage is reduced. More hand washes per refill means up to 80% less packaging waste. New pump and delivery tube with every refill eliminates mess, clog and leaks. No downtime, costly repairs and cleaning, or replacement parts. Energy efficient cam-gear technology provides industry-leading battery life – up to 120,000 cycles or 3 years.